Maharashtra farmers' protest: Farmers and tribals from across the state began their protest on March 6 from CBS chowk in Nashik, and have walked over 160 kilometres in the last six days. Here is the latest news and updates. Agitating farmers called off their stir on Monday after Maharashtra Chief Minister Devendra Fadnavis said his government has accepted most of the demands of the farmers. “We have accepted most of their demands and have given them a written letter,” Fadnavis was quoted as saying by ANI. The government also said the issue of forest land transfer rights would be resolved within six months, adding that a committee would be set up with two representative from Akhil Bharatiya Kisan Sabha to look into problems of loan waiver to adivasis and farmers. Speaking in the state legislative Assembly, Chief Minister Devendra Fadnavis said his government was open to talks with the farmers’ body, and that it was willing to consider all the demands put forth by farmers and tribals. 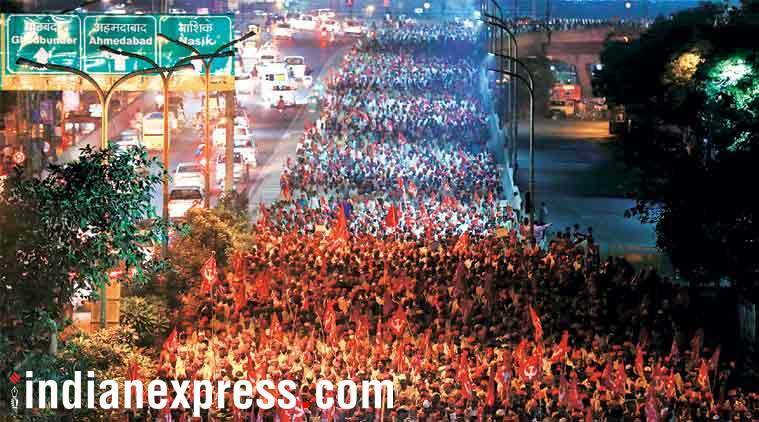 Nearly 40,000 farmers and tribals, who began their protest on March 6 from CBS chowk in Nashik, reached Mumbai early this morning; they have walked over 160 kilometres in the last six days. The farmers have a list of demands for the BJP-led government, including a complete loan waiver, an overhaul of the river linking scheme keeping in mind the tribal villages and implementation of recommendations made by the Swaminathan Committee report that asserts farmers should be paid one and a half times the cost of production. Congress president Rahul Gandhi, meanwhile, said the party stands with the farmers and tribals. Taking to Twitter, he said the march shows the central and state government’s apathy. He appealed to Prime Minister Narendra Modi and CM Fadnavis to “not stand on ego” and accept the demands put forth by the farmers.